With the Queen's Jubilee just a few weeks away many of us are purchasing flags and bunting and planning garden parties to celebrate 60 years of her reign. 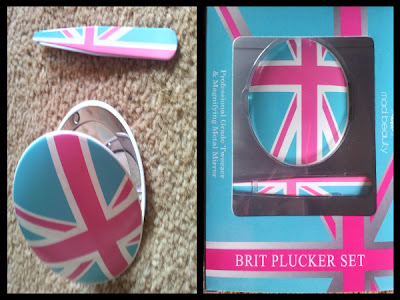 The lovely people at Prezzybox have a great selection of gift ideas for everyone and they have kindly provided me with 2 British themed products to review... and another two are up for grabs for your Jubilee Celebrations! These British themed stands will present your cupcakes (and other snacks) perfectly for your garden or street party this June. They are made from sturdy card and are so simple to assemble it really is a piece of cake! The tiers have different images on and are reversible so you can pick and choose your favourite. An ideal centrepiece for any table and they can be used for other celebrations too as they are easy to take apart and store back in the bag they arrive in. This stylish yet practical set is a stunning duo for your handbag. The magnifying mirror is great for makeup application when on the go and the professional grade tweezers are ideal for removing stray hairs. With the Jubilee and Olympics on the horizon this little set is super! If you fancy buying these lovely items or shopping from a huge variety of other fantastic products you can head over to Prezzybox. 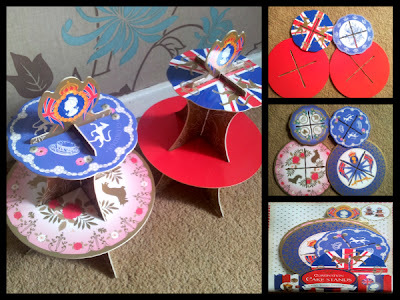 For a chance to get your hands on your own British Street Party Cake Stands and Brit Plucker Set you can enter below! The closing date is May 30th. Going to work to make sure that the British public have a happy holiday! I wont be doing much at all. Probably enjoying everybody being in a good mood because they have an extra day off. Not sure yet but there are local events on so may go to one of those. I will be going to a party at our local village hall. We are having friends and family over, and whether its rain or shine we will have lots of food, lots of booze and lots of fun. We will make it themed and everybody will dress up. Eating cake and drinking tea! Great prize would love to win and celebrate with the family. No street party I know of so will be spending it at home with the family. We are having a Afternoon Tea themed street party! im off to london to visit the queen - well to sit outside buck house and watch the parade. A bbq if the weather holds up. The plan is to have a little gathering of close family and friends with Brit foods and copious amounts of wine, weather permitting. Huge party whatever the weather! Taking the kids to a street party. Our village has a community picnic in the park, then I expect we'll have a BBQ at ours with friends! We will be just having major family time, food, drink, crafts, and hopefully being outdoors! We're going up to the Family Fun Day in Hyde Park - we're taking a picnic and I'm hoping to get lots of good photos of people being patriotic, and having fun. I just hope the rain stays away on the day! We have some good friends who are out and about all weekend with their little marching band raising money for charity at several events, so I think we shall go and show our support and join in the fun. It has to include sunshine (?? ), bunting and endless cups of tea! We are going to the Victorian town at Ironbridge where they are having a jubilee party.. for Queen Victoria! Having a 1952 themed street/friends party, weather permitting! Snacks, drink in, family round, TV on and enjoy the spectacle. Hope it is as good as the last Royal Wedding. Hope Philip Schofield is hosting somewhere, he was so funny last time. I will be visiting with my neighbour and her children for dinner and a get together. Her two older boys will be going to London with her parents for the Jubilee so she wanted to do something together before they go. We decided to suprise her and her daughter by taking them to Camelot with us. BBQ in garden with a few drinks to toast the Queen. Watching festivities on the TV. Making sure my step daughter has a fab time with us! we are having the whole family together ! 4 generations !!! The whole family are coming round to a BBQ - it will be hectic and noisy and lots of fun. Games, food and laughter a wonderful way to spend the afternoon, lift spirits and celebrate. We are having a street party! we are having a family bbq. hope the weather will be nice! Travelling down Saturday, going to the theatre Saturday night,then Sunday will be spent in Hyde Park at the Jubilee Family Festival, then hopefully off to the Thames to see the boats, then theatre again Sunday night then home (exhausted but happy) on Monday ;-) can't wait!!! Then when I get home we're having our own Jubilee party for friends and family. I really will be shattered!